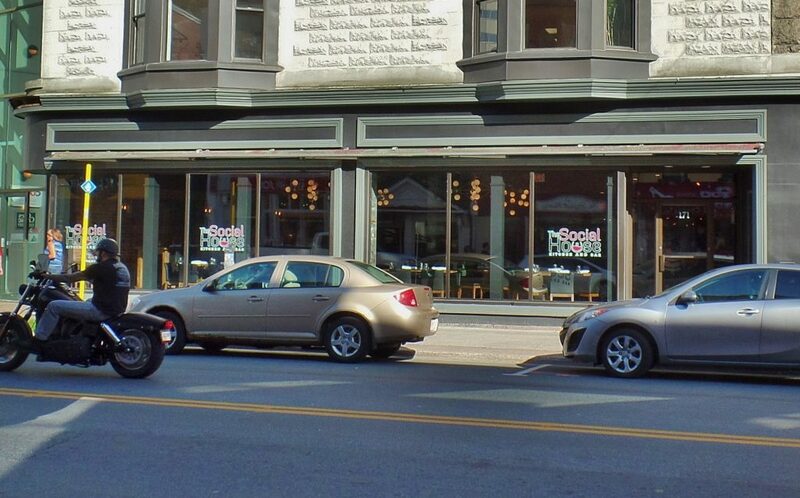 In the case of David Primmer and his former business partner, chef Evan Bursey, the misunderstanding was, apparently, motivation enough to cause them to part company (amicably I believe) not long after their restaurant, The Social House Kitchen & Bar opened in late summer 2015. By January of this year Bursey had left to plan another restaurant, Fort Amherst Pub, and Primmer had given The Social House a new name, The Fifth Ticket. Why The Fifth Ticket? Primmer and eight co-workers won $30 million on the lottery and it was their fifth ticket that had the winning number. Since Primmer has sunk a portion of his cut into the restaurant the name makes sense. Perhaps he feels the handle will bring more good luck, although as far as The Fifth Ticket is concerned, I don’t think he’ll need it. I had given the original restaurant a glowing review and, as far as I could tell, the business was going well. Then, in December, I heard rumblings that Evan Bursey was leaving. Every restaurateur who isn’t a chef knows deep down (although they’ll never admit it publicly) that without a highly competent, skilled chef in charge of the kitchen, a restaurant has no chance of succeeding. None. David Primmer eventually found a chef for his newly named restaurant. He is Nick Jewcyzk. Because of the change in chef and a significant change in the menu, I felt it was important to take another look at the restaurant now called The Fifth Ticket. 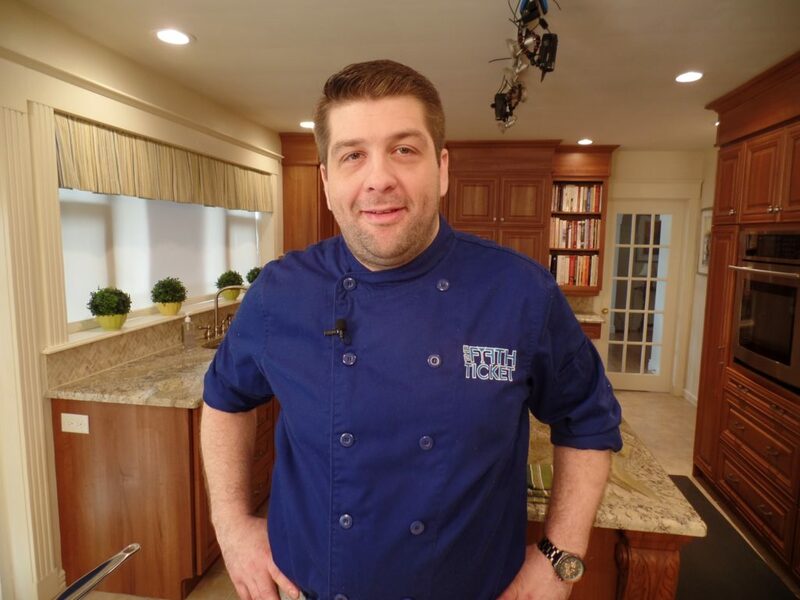 Chef Jewcyzk, is an affable guy with tall, broad physical presence. After learning the fundamentals of the trade at the Pacific Institute of Culinary Arts and from highly respected BC star chefs Robert Clarke and David Hawksworth, Nick Jewcyzk worked at several well respected restaurants. Fifth Ticket is his most significant executive assignment to date. Fifth Ticket is little different physically. It has the same energy and agreeable atmosphere. We visited on a Wednesday evening and, as it had been on my initial visit, the main dining space was quite busy. Contentment registered on many faces. Fifth Ticket’s lounge in the next room wasn’t really going yet because the live music didn’t start until 9 p.m. I’m told Thursday, a strictly jazz night, sizzles. Jewcyzk’s menu, in its essence, is similar to the restaurant’s previous offerings. Most dishes are familiar and approachable; but, there are many more of them. Fifth Ticket’s menu is more than double the size of the restaurant’s previous card, and new ingredients like lamb and fresh tuna show up more than once. First morsels were slices of fresh bread with thin, flaking, golden crust. It had a springy consistency similar to angel cake. 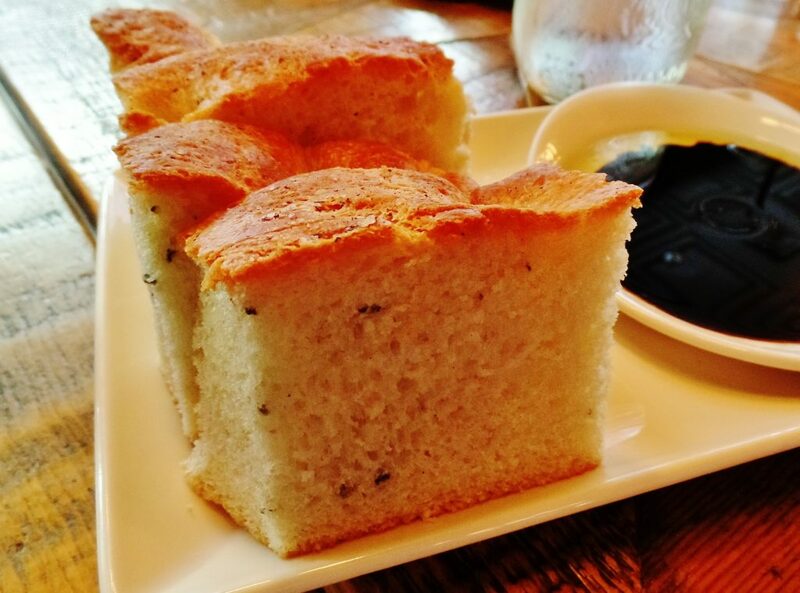 Served with extra virgin olive oil and balsamic vinegar for dipping, the bread soaked up the liquids like a sponge or sheet of Bounty no-quit picker-upper. Of course, that’s the kind of bread you want to serve with a liquid dip. I like the taste of balsamic and olive but the nuanced flavour of the bread would, perhaps, have been better served by butter. Onion rings battered and fried are nothing new but how about pickled onion rings? 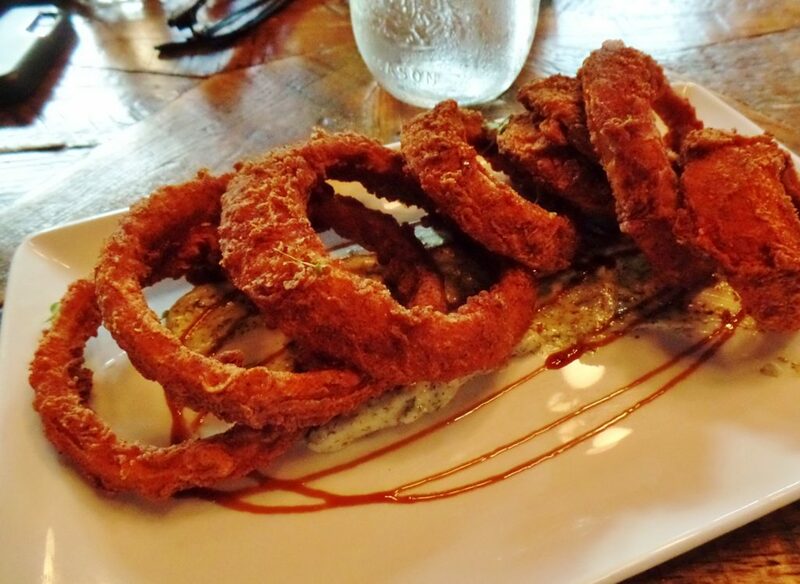 Red wine pickle with spice had rendered Spanish onion rings much more rambunctious than usual. Although lacking in the light crispness of fast food rings, Fifth Ticket’s had crunch and the kick of a stallion. Along with a calming buttermilk dill aioli they were a welcome change from mundane aros de cebolla fritos. Kudos to Nick Jewcyzk for daring to stray from the ubiquitous meat laden charcuterie board. 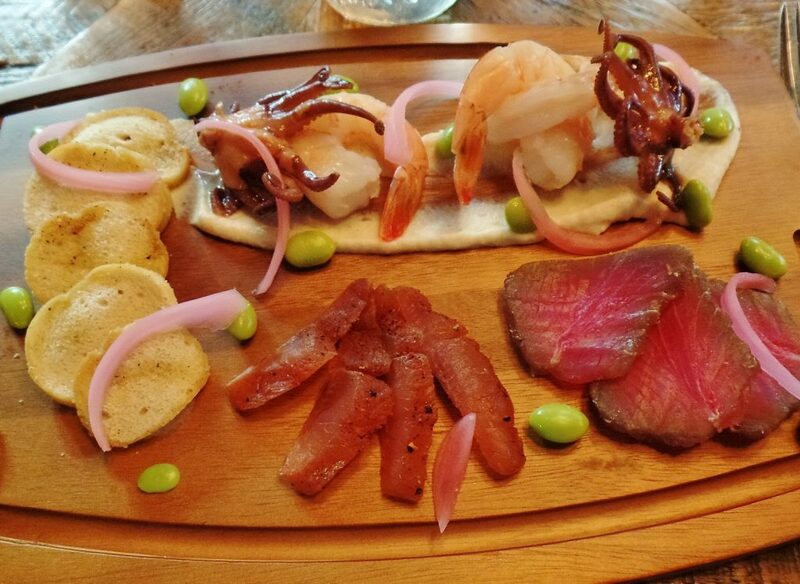 His featured chilled jumbo shrimp, citrus tuna ceviche, octopus and salmon pastrami. I noticed the already sufficiently salty salmon and tuna had been freshly sprinkled with new salt, a bit like taking coals to Newcastle. In flavour and texture, the board was a triumph. Everything was beautifully succulent, even the hard to wrangle octopus. Shrimp togarashi (Japanese for chili pepper) was an excellent example of the simple crustacean being elevated to stand alone first course. 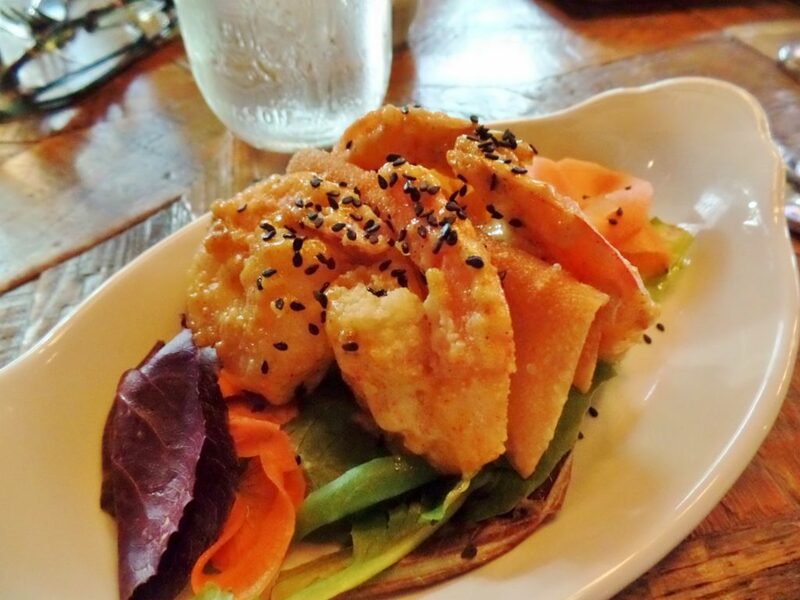 Several large shrimp had been lightly coated in eggy batter and fried, then dipped in an aioli flavoured with togarashi. Black sesame seeds, leafy greens and veg ribbons made for an eye appealing presentation. 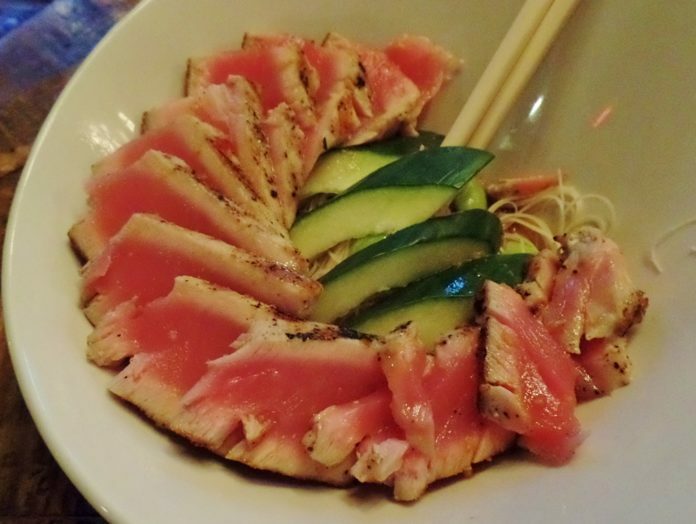 Fifth Ticket’s grilled yellowfin tuna (cooked rare) was first a visual treat, then a taste delight. Slices of melt-in-the-mouth pink, rare tuna were presented overlapping each other around a centrepiece of brown rice vermicelli and vegetables livened with soy-based ponzu sauce. 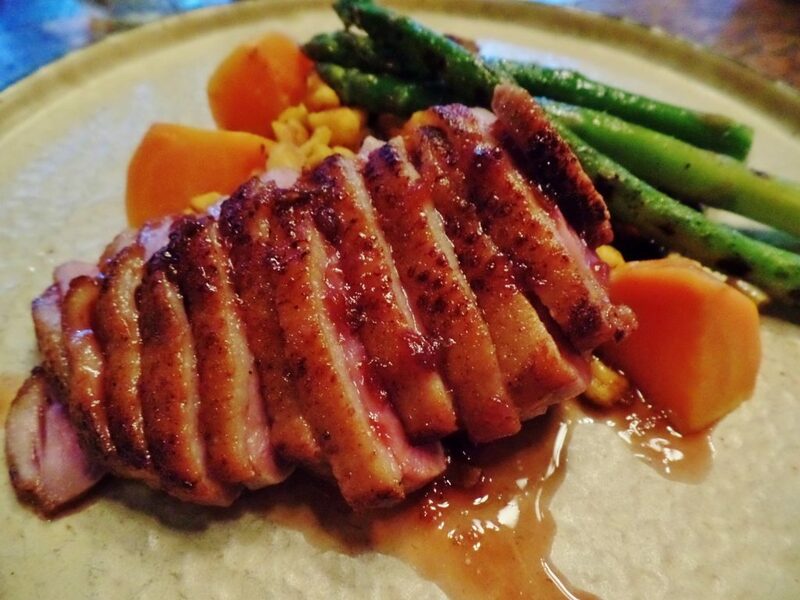 I enjoyed Fifth Ticket’s pan roasted duck breast with its fatty, rich skin. One of my dining companions agreed that it was the most tender duck breast he’d ever tasted. Yet, it was different. The meat’s texture reminded me of cured ham. I wondered if the duck hadn’t been dry brined. It’s a technique that can yield poultry tender but, at the same time, create a smooth, dense texture similar to cured ham. Delicious sweet potato spätzle, black beans, corn, smoky bacon and vegetables augmented the plate. 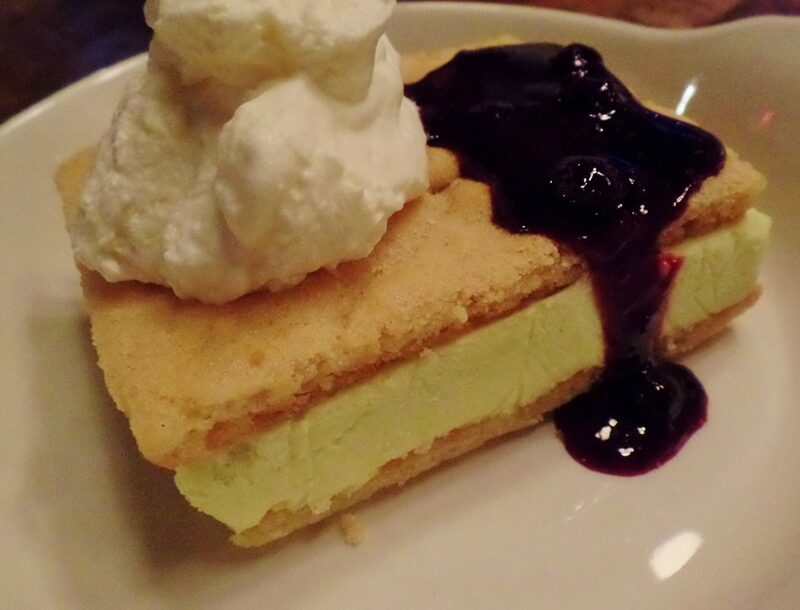 A simple lemony ice cream bar brought the meal to a mouth puckering finale. Zippy citrus lemon ice cream between two sugar soaked wafers woke up any taste buds that may have been on a break after a busy evening. Crème Chantilly and blueberry sauce further tempered the ice cream’s tang with their extra sweetness. 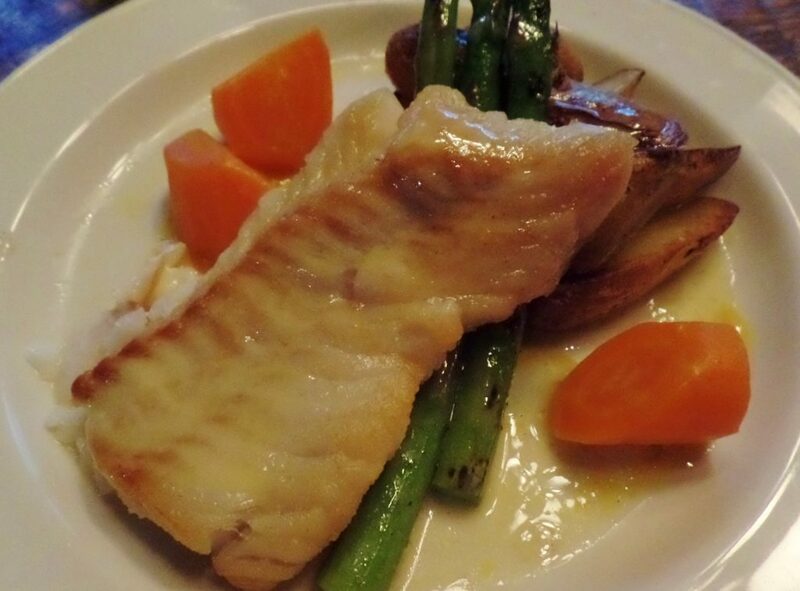 Fifth Ticket’s menu, service, atmosphere and amenities are of the highest order. Long before his windfall, David Primmer had a dream to create a restaurant. He was literally saving his pennies to do it. Now, well ahead of schedule, he has done just that. 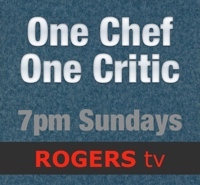 More than that, he’s created one of the very best restaurants in the province. Price Dinner for two with wine, tax and tip costs (approximately) $160. 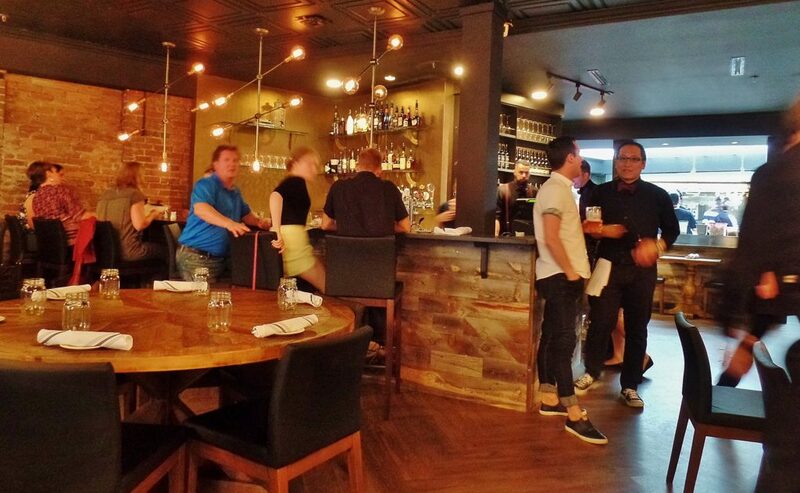 Atmosphere Has the vibe of an upscale, big city bistro. Sound level Moderate to slightly high. Open Sunday: 11 a.m. to 3 p.m., 5:30 p.m. to 9 p.m., Monday: Closed, Tuesday: 5:30 p.m. to 9 p.m., Wednesday and Thursday: 11:30 a.m. to 2 p.m., 5:30 p.m. to 9 p.m., Friday: 11:30 a.m. to 2 p.m., 5:30 p.m. to 1 a.m., Saturday: 11 a.m. to 3 p.m., 5:30 p.m. to 1 a.m. Beverages Fifth Ticket has a solid list of cocktails, beers and wine. Wheelchair access Assistance required at entrance, accessible tables, accessible restroom.